I’ve featured the work of many talented Pakistani designers on the blog before and am super duper excited that for the first time I can actually attend PFW London on 8th & 9th June. This is the fourth season that the wonderful team at Riwayat will be bringing the best of Pakistani fashion over here with a series of catwalk shows across the weekend as well as designer stands- so not only can you see the best of Pakistani fashion you can buy it too! I’m sure I will be bumping into many a bride to be! I will be taking over the official twitter account (thanks so much to Adnan & Chris for inviting me to take part) and will be tweeting all the news and pics from the shows and I’ve been given exclusive access to the backstage area so will be taking you behind the scenes too! Nomi Ansari at PFW3. How yum is that outfit. 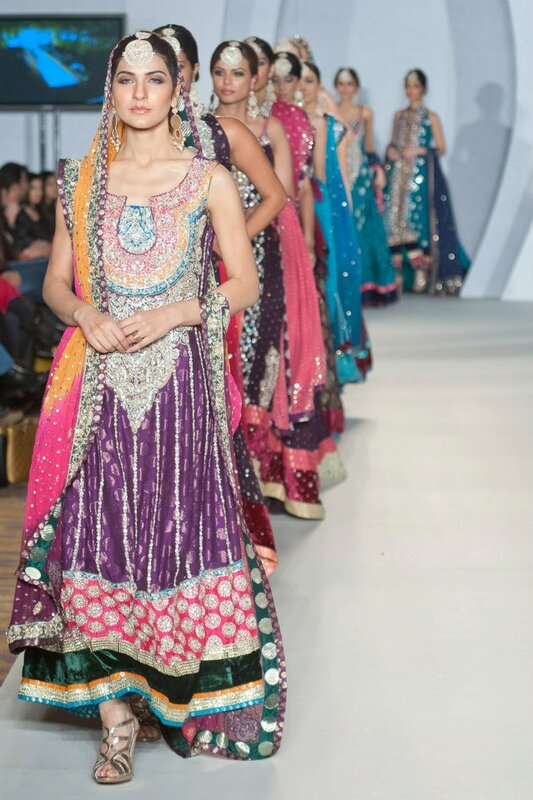 Gul Ahmed, G Pret S/s 13 image and the range Gul will be showing at PFW4 is G Pret 2014! Yep that’s right next year’s collection now! and available to buy!!! The designer line up includes Zeeshan Bariwala, Zainab Chottani, Al Karam Textiles, Sadia Mizra, Ayesha Aejaz, Najwa Imran, ORIGINS, Sophia Metha, Parvesh and Jai, Gul Ahmed. If you haven’t got your tickets yet buy them here now! I can’t wait for next weekend! can you?